Arizona-based restaurant group Pita Jungle announces the roll out of ServiceGuru to help track, measure and improve customer service and overall experience. ServiceGuru is a kiosk-based rating and review solution that helps company’s in various industries track, measure and improve customer service. “Pita Jungle is now receiving unprecedented amount of data that they would have never heard from customers before,” says ServiceGuru Founder and CEO Kevin J. Berk. “With online reviews survey links on receipt, comment cards, etc., most businesses are only hearing from an insignificant number of customers. ServiceGuru has created a simple and fast way for people to leave customer service feedback. This means owners/managers can now manage their business with up to 50X more service feedback. Now they are seeing more than the tip of the iceberg and are able to make better business decisions.” In addition to being able to quickly collect feedback from customers about their overall experience, ServiceGuru also allows customers to rate the service they receive from individual employees allowing Pita Jungle to better understand the service their staff is providing to its customers. 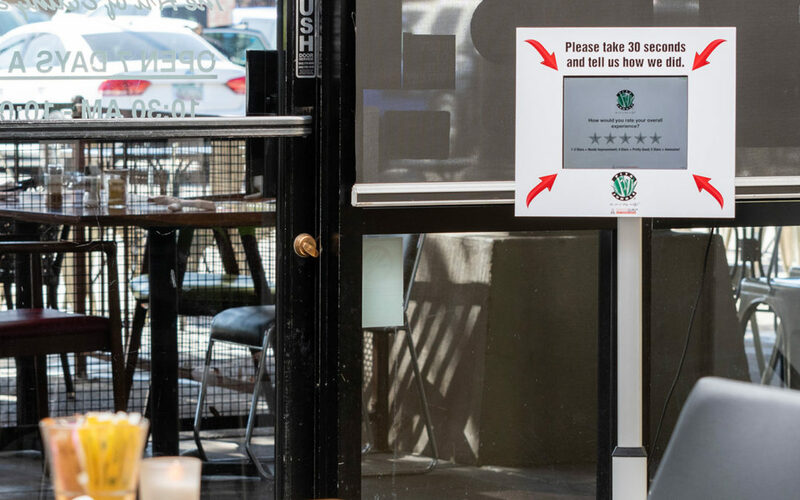 According to Berk, each Pita Jungle location with the Kiosk is receiving approximately 50 times the amount of feedback versus all other review sites such as Yelp, Google, TripAdvisor and Facebook combined. In addition to more customer feedback: Pita Jungle is capturing emails for their Circle of Friends email program. Real-time notifications allow Pita Jungle to resolve customer issues very quickly, which results in mitigating negative reviews online and engagement by the employees has never been higher. Pita Jungle is one of many businesses to implement ServiceGuru. The kiosks can be found within restaurants, retail, medical practices, hospitality and service-based businesses from local to national brands. For more information on ServiceGuru, visit www.serviceguru.com. There are 18 Pita Jungle’s in the Phoenix Metro area, two in Tucson, and one in Flagstaff. To learn more about Pita Jungle, visit www.pitajungle.com. Founded in 1994 by three college friends, Pita Jungle stands today as the go to restaurant for healthful but delicious food with 21 locations throughout Arizona. With the mission of helping guests sustain a healthy and balanced lifestyle, the restaurants serve up a diverse menu of tasty, fresh, wholesome foods, including a variety of vegetarian, vegan and gluten-free options. Pita Jungle’s menu is influenced by tastes from around the globe with the benefits of the Mediterranean diet always apparent through the use of healthy lean proteins, veggies, legumes, nuts, grains and fruit. For more information on Pita Jungle, please visit www.pitajungle.com.